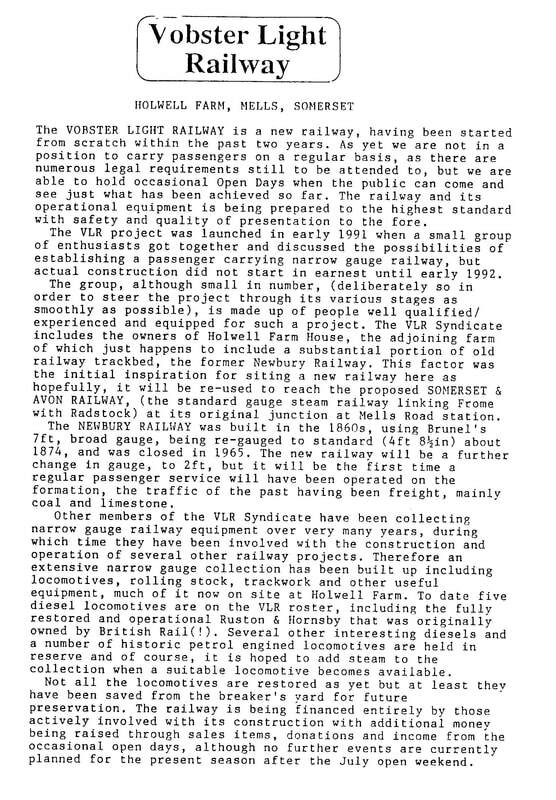 ** Please note - a short piece on the Vobster Light Railway follows at the very end of this section. 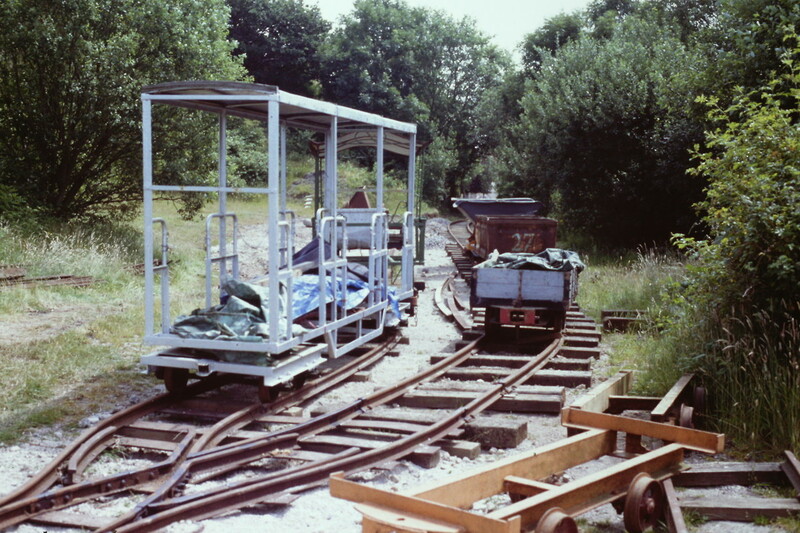 Ride a trolley on the Radstock branch. 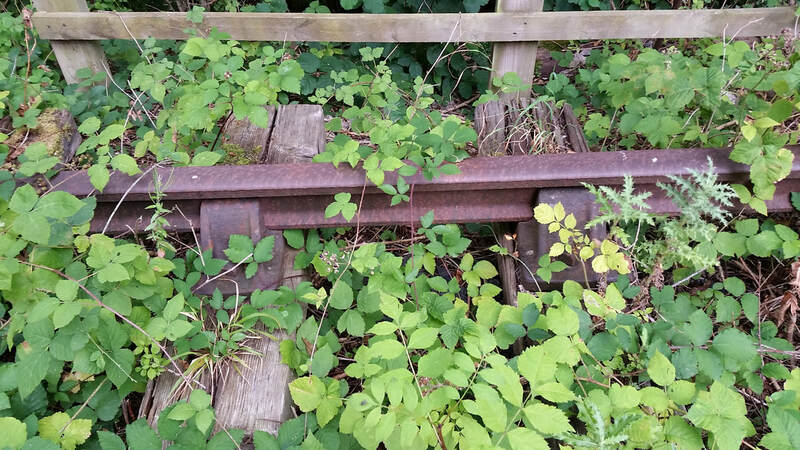 Some clips of a trolley ride on the abandoned and overgrown section of the Radstock branch can be seen here - https://www.youtube.com/watch?v=b0p-am4Zl2w this section is alongside a public footpath. Quite how one would stand regarding liability and insurance is not known. 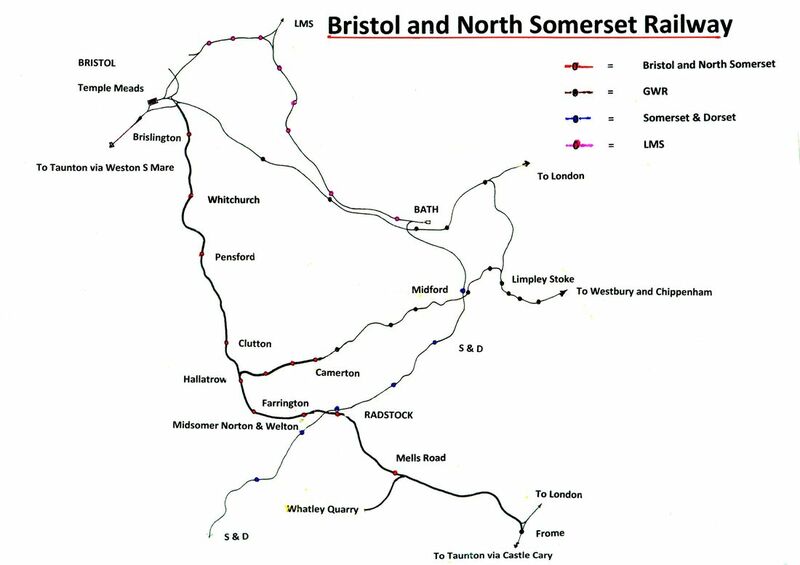 A rough sketch map of the Bristol and North Somerset Railway showing connecting and inter-connecting railways along the route. Frome area RTT plan - with Radstock added. Courtesy Guy Vincent. A concise record of the history the this line can be obtained by clicking on this link,www.northsomersetrailway.com/history.php North Somerset Railway Company Ltd.
Frome North Junction Signalbox diagram. 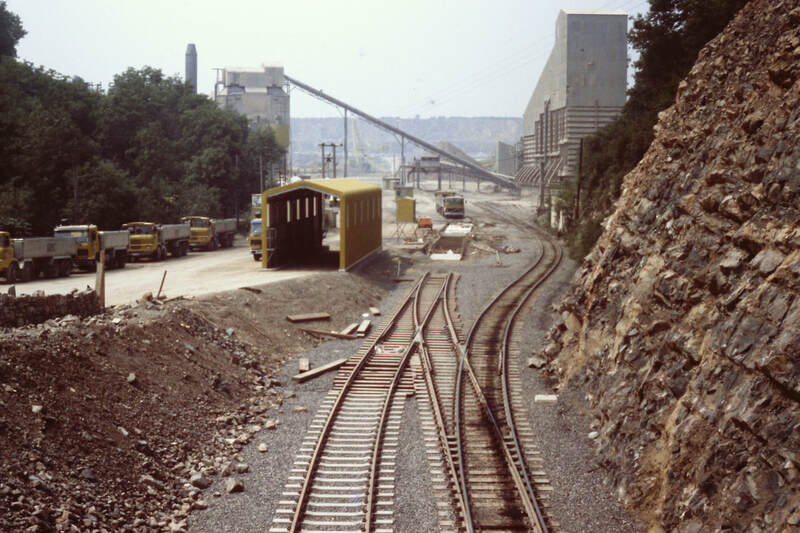 The line indicted branch up and down is that to Whatley Quarry and formerly to Radstock and Bristol. The diagram is dated 10th September 1974. Courtesy the Guy Vincent Collection. 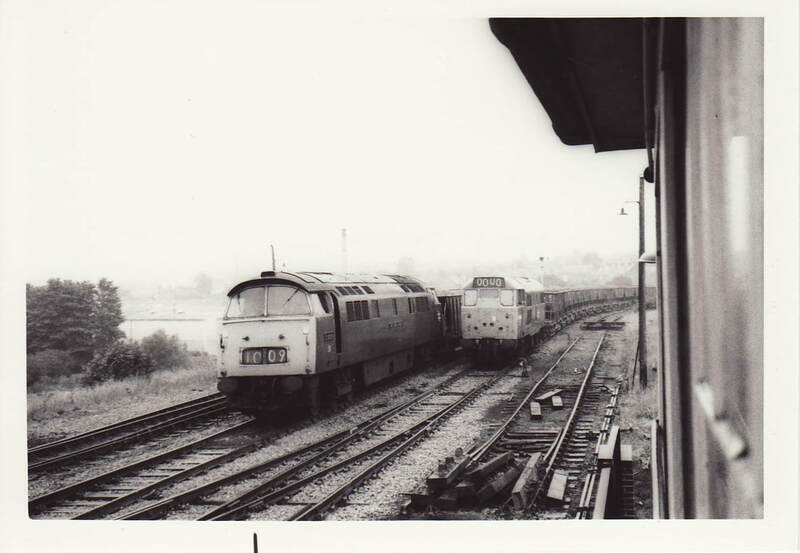 Various pictures of Frome station appear in our section Taunton to Westbury and in addition three stone train workings copyright the late Bob Taylor courtesy Guy Vincent. 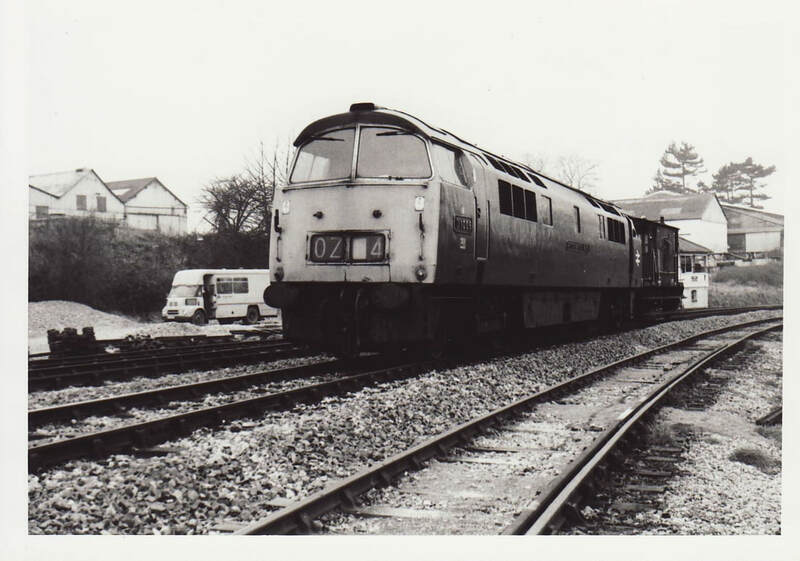 D1006 Western Stalwart is seen in Frome West Yard on the 23rd February 1975 Copyright Bob Taylor . Frome Welshmill Allotments about 3/4 mile north west of Frome station. 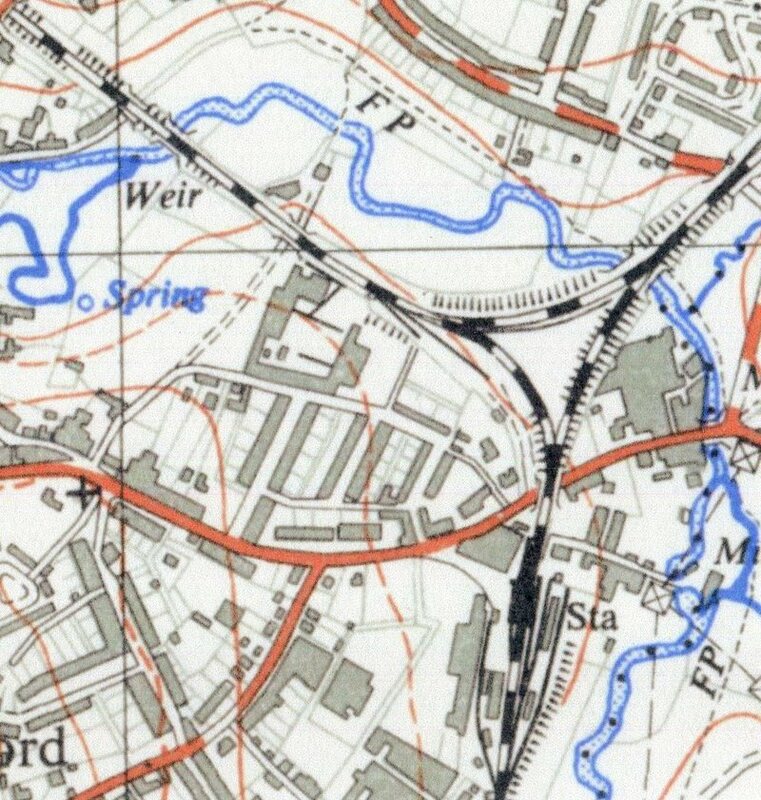 Reproduced with permission of the National library of Scotland OS Map Great Britain 1937 /61 Frome west siding is shown inside the triangle alongside the Radstock branch. 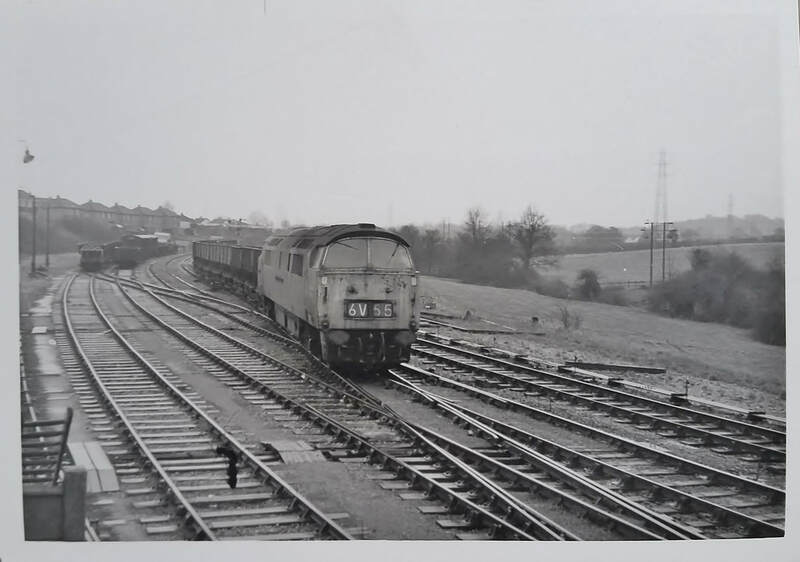 Frome West sidings were actually located in the triangle of land between Frome South, West and North Junctions. 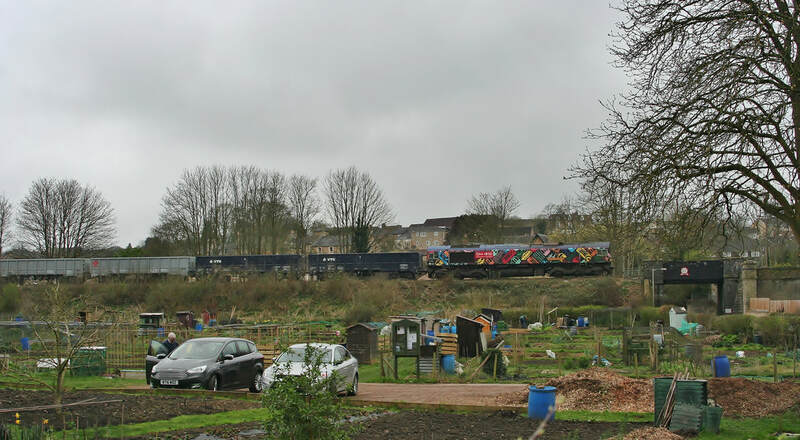 A passenger train today running from Frome towards Westbury skirts the area, visible to the left and now covered in new housing, after the train has passed signal W195. Frome West Ground Frame 'box was at the Radstock end 'tip' of this triangle. 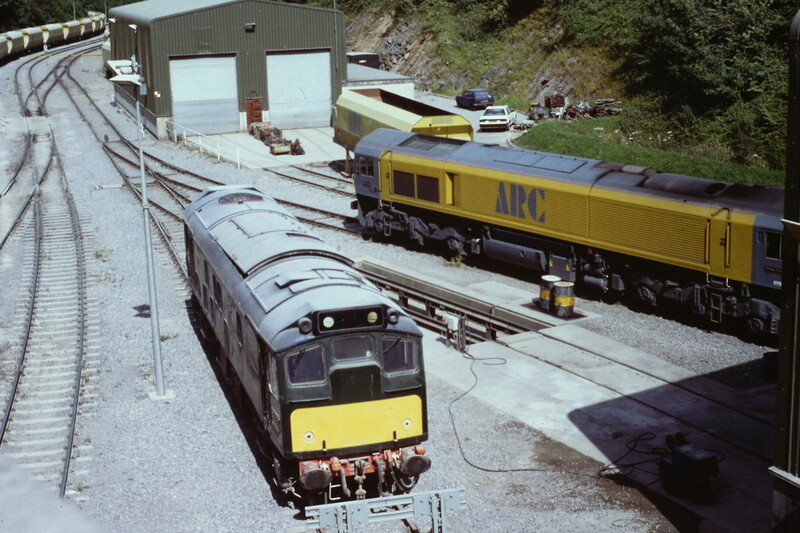 The sidings where 33032 stabled after the collision ran approximately parallel, on a lower level, to the freight-only line (which still exists as the first stretch of the Whatley branch) from Frome North Junction to the former Frome West Junction. 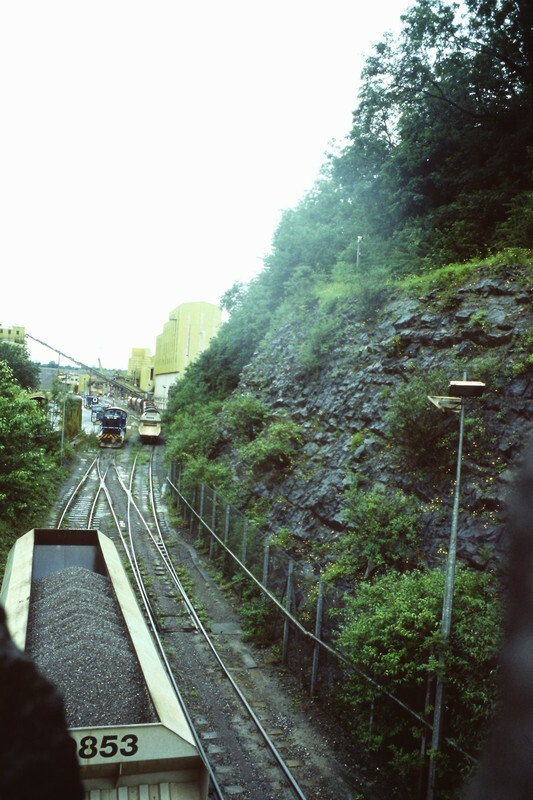 The second picture of 33032 shows the line (looking towards West Jctn site) on the right at a higher level. 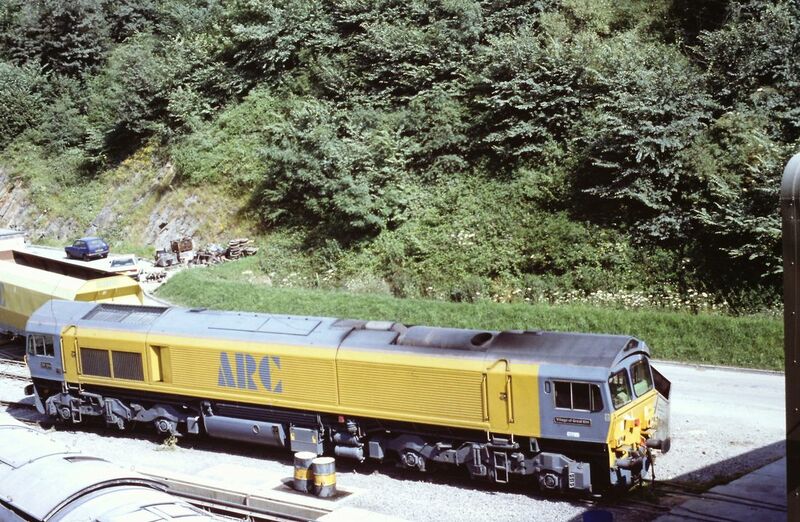 Some other sidings existed further back and I remember in the mid-late 80's Bardon Aggregate bogie hoppers being loaded here by mechanical excavators prior to dispatch by rail, usually hauled by class 56 locos. 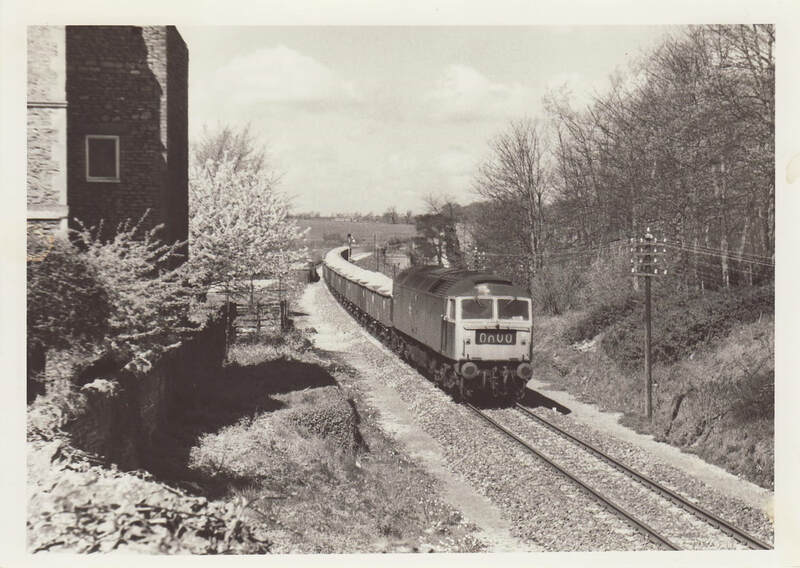 A classic picture as 47148 appraoches Frome West on the 27th April 1977 on a stone train from Whatley. Copyright Mike Ware. 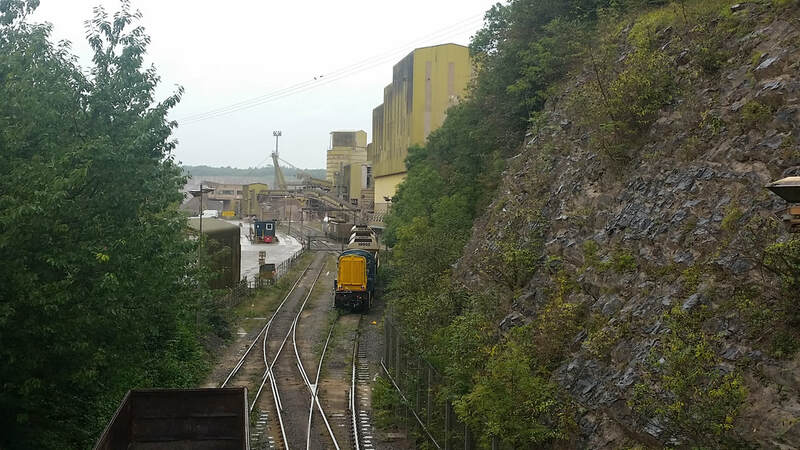 Despite the rain I felt like spending the morning 'spotting' for a change so first port of call was the former ARC (now Hanson/Heidelberg Cement) quarry at Whatley near Frome. 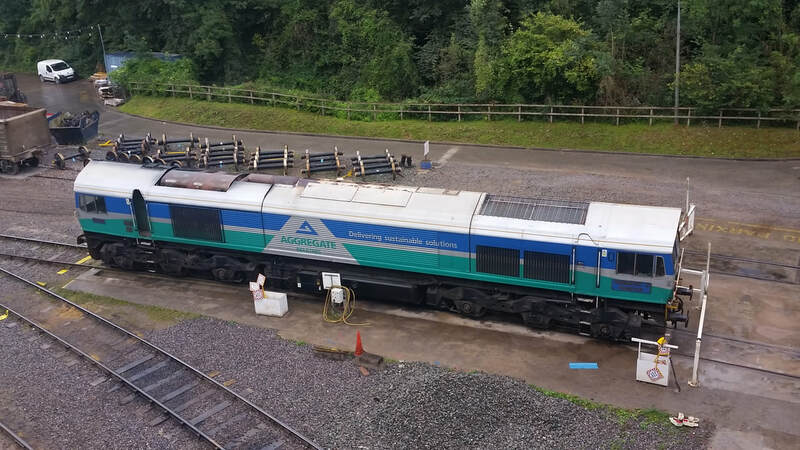 Here, two former BR class 08 shunters 08650 and 08947 (a former long-time Westbury resident) currently reside and it was possible to photograph them from the road bridge and quarry entrance gate, plus solitary mainline diesel 59005 'Kenneth J Painter'. 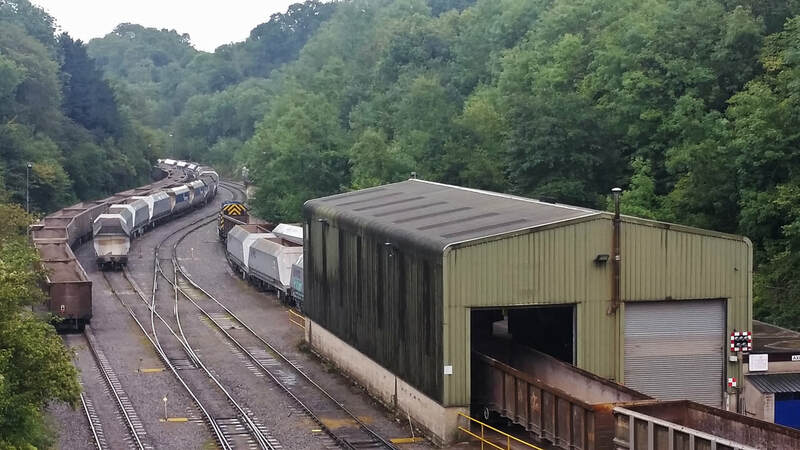 Whatley is located in a quiet country area and rail connected by way of a stretch of the former GWR Frome-Radstock branch line which is used between Frome North Junction and Hapsford Junction, a distance of 2 miles 38 chains. 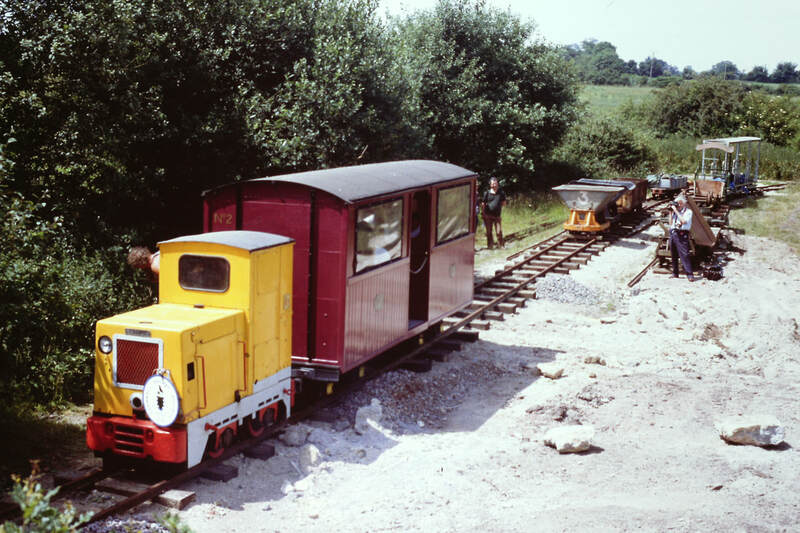 From this point the short link line down to the quarry is relatively new, it was built in the early 1970s to allow mainline locos through due to the original route being too restricted by height/width/weight limitations. Three short tunnels are included in this new stretch, Bedlam, Great Elm and Murdercombe plus a heavy duty rail-over-river bridge. 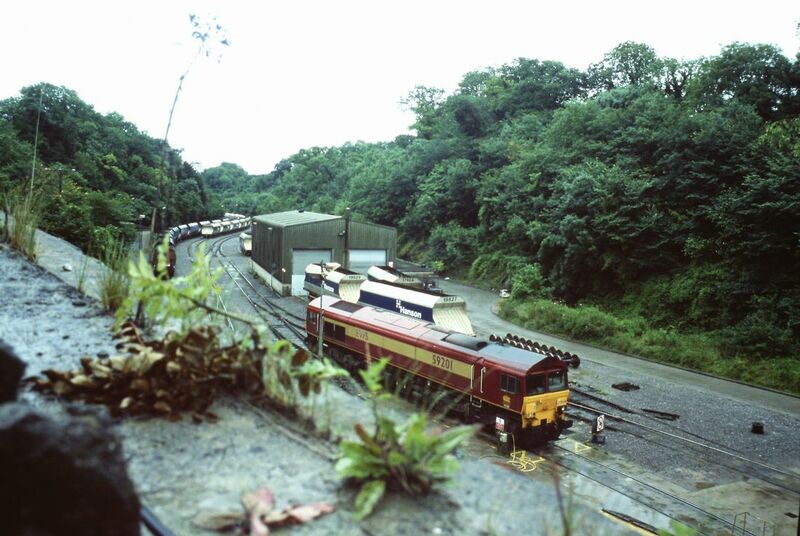 Beyond Hapsford the Radstock branch has been disused since July 1988 when the Marcroft wagon repair works closed. The points have long been removed and the associated cabling has also been taken out. 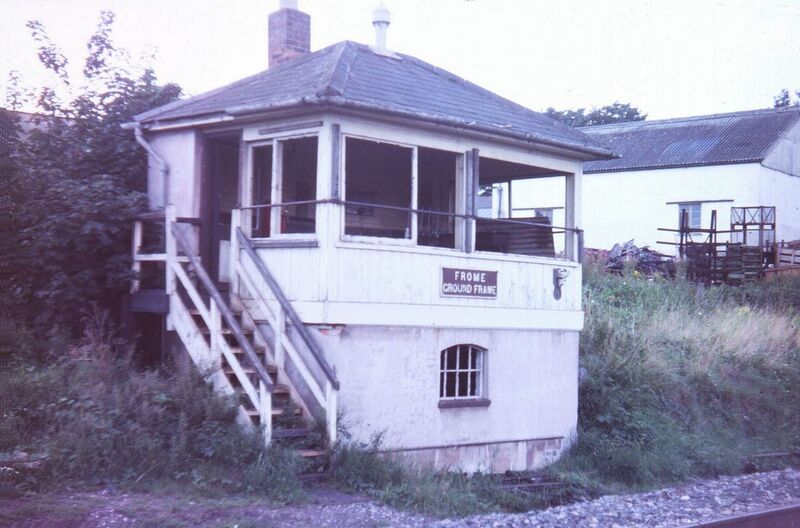 The branch was included on Westbury Panel when the Frome area was re-signalled in 1985 but only as a token-worked long siding with no signals provided. 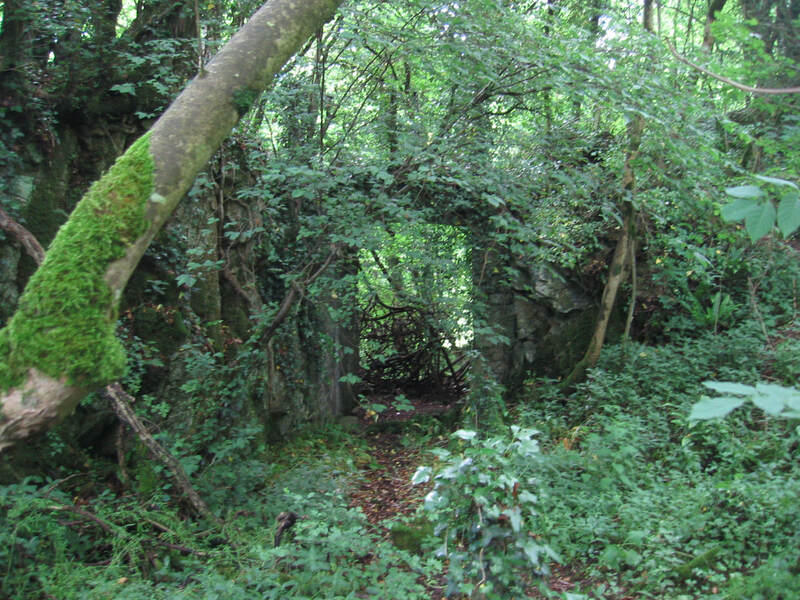 Much of the old track, now overgrown and unusable, remains in-situ. 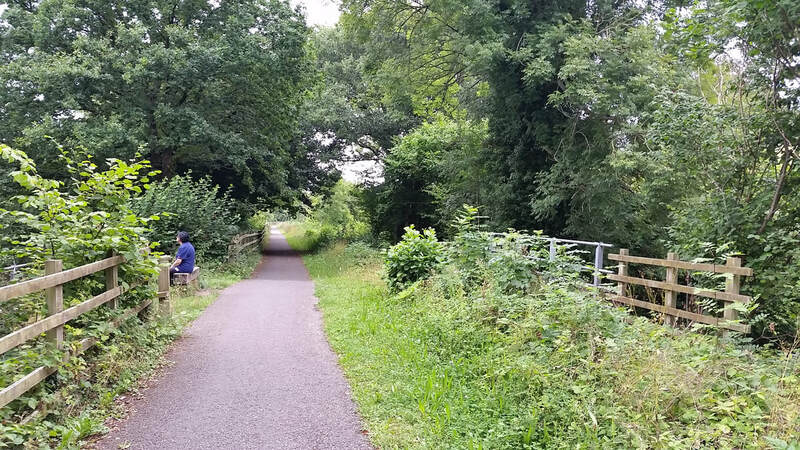 Nature has well and truly reclaimed most of the route and it is possible to walk/cycle over it from Buckland bridge (Buckland Dinham) to Radstock town centre via Mells Road and Kilmersdon, this now being part of 'The Collier's Way'. 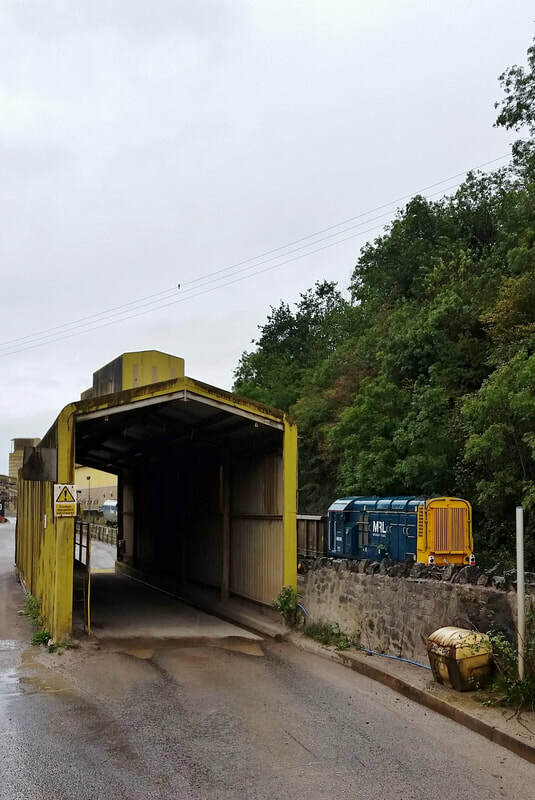 Various proposals have been put forward over many years to re-open the line from Radstock through to Frome but no physical work has yet been undertaken along the route which has suffered several landslips and become heavily wooded in places. 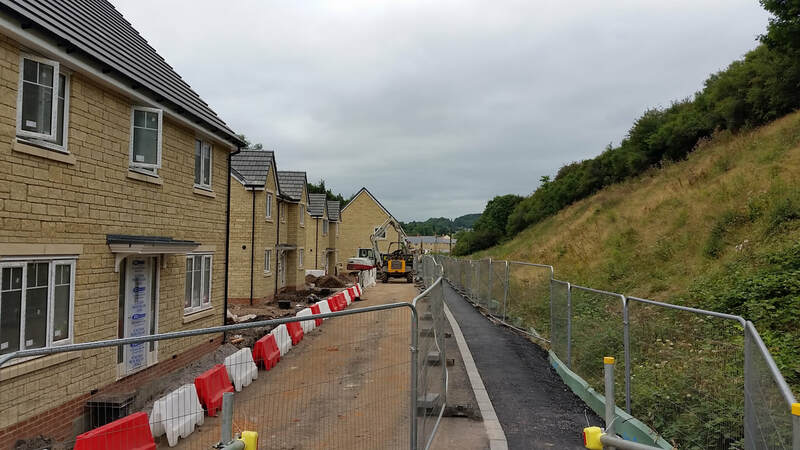 Housing now occupies the former extensive goods yard at Radstock with just a small narrow strip to one side, very close to the housing area, for any possible railway use. 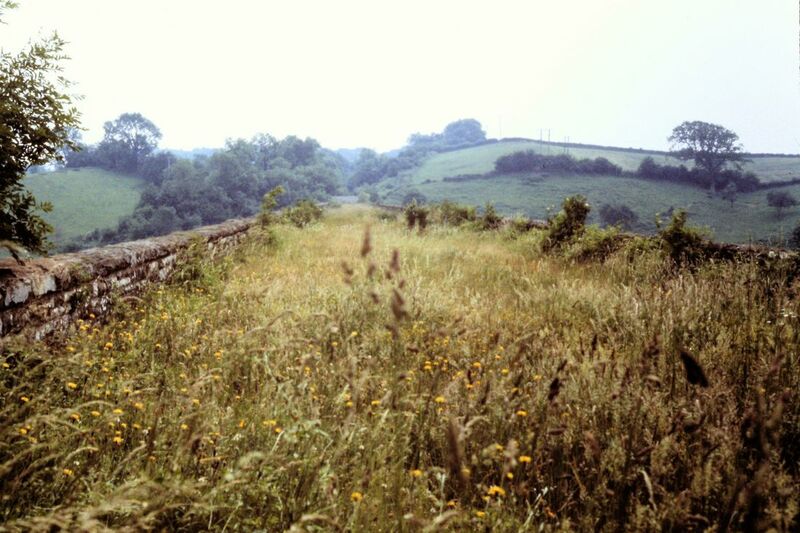 Personally I think Somerset is already well catered for as far as heritage railways go and the Radstock route should be left as it is, a green oasis and wildlife haven. Guy Vincent Many thanks to Guy for the above details. HAPSFORD JCT OS 25 inch Scotland, 1892-1949 England and Wales, 1841-1952 'Reproduced with the permission of the National Library of Scotland. This map shows the original branch the route of which was subsequently considerably altered to permit the operation of modern locos and rolling stock. Frome to the right, Radstock to the left. Bedlam Tunnel No pictures yet 13 Chains long. Murdercombe Tunnel No pictures yet. 2 Chains long. 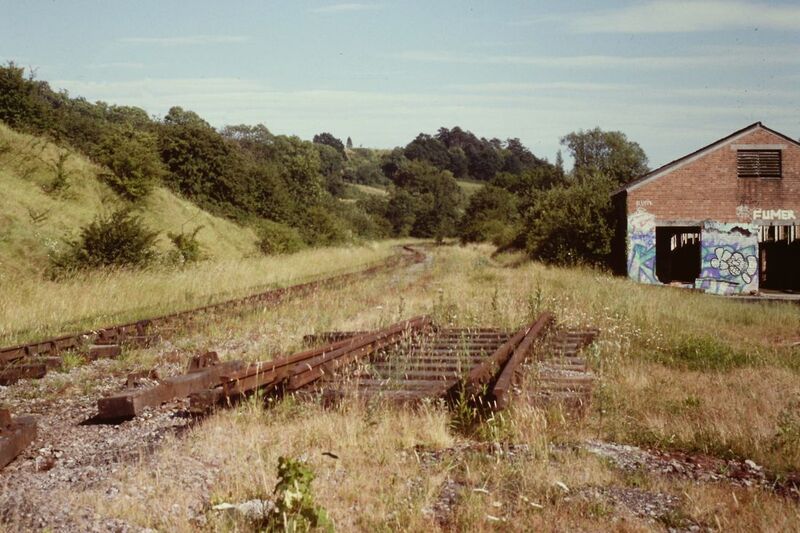 Where the Whatley Quarry branch left the Frome, Radstock, Bristol line was known as Hapsford Junction. 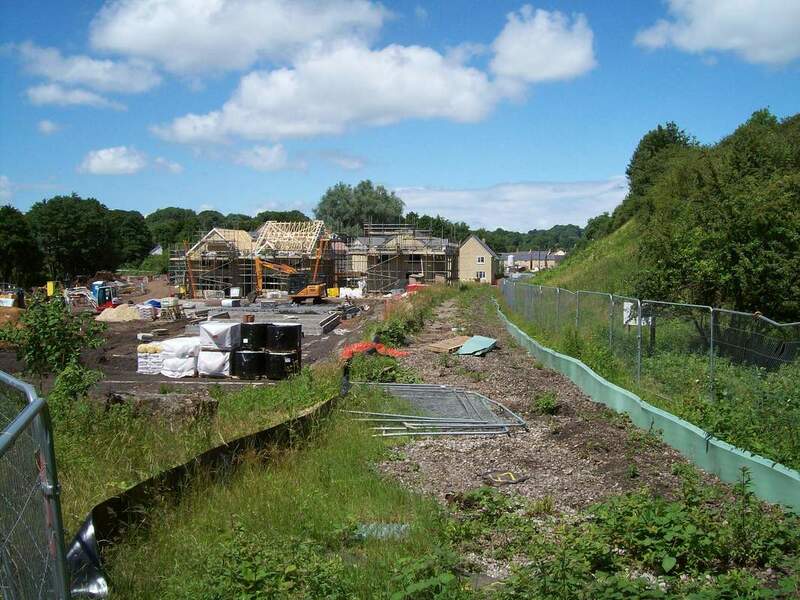 Although a group exists with the intention of re-opening the Frome - Radstock line from Hapsford Junction, and we wish them all the best, there doesn't seem to have been much progress since 2016. 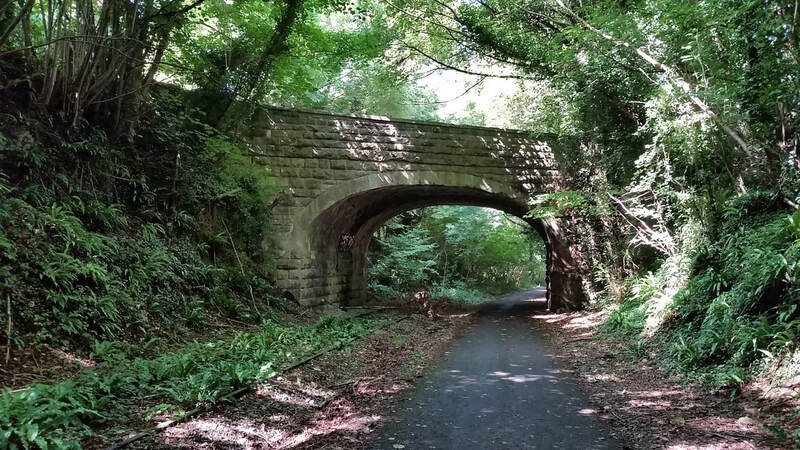 Guy Vincent has very kindly written a report on this barely existent stretch of line which appears below together with his photographs - after his report which goes as far as Radstock we continued our coverage from Mells Road to Radstock. 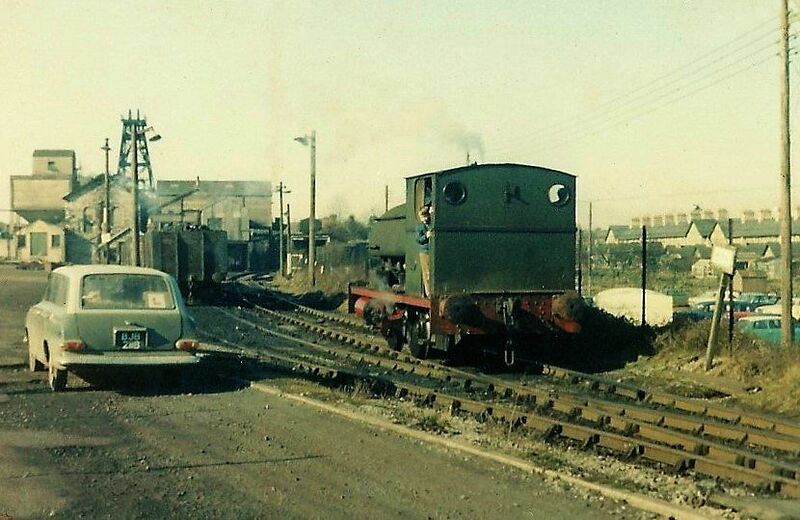 A brief update on the Radstock-Frome 'North Somerset Railway' situation as requested by Clive Smith. 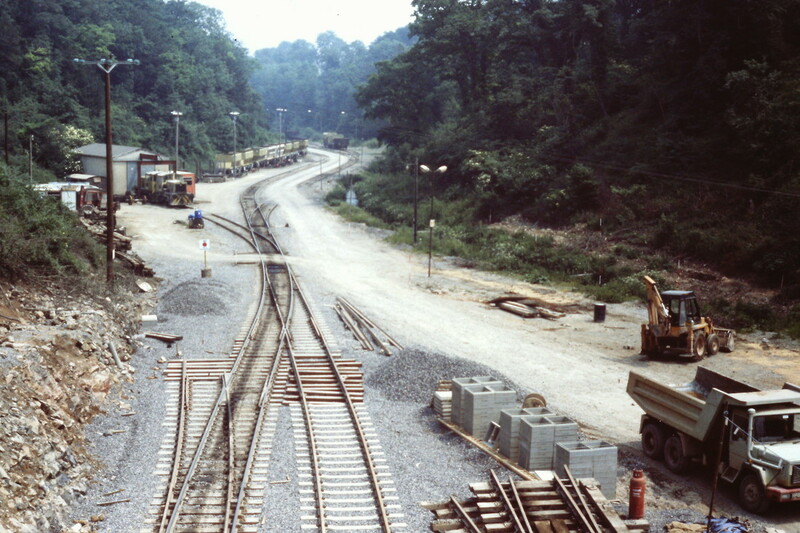 The former GWR station and goods yard sites at Radstock have now been redeveloped with housing and a new main road has been built at the western end. A narrow strip of land, in close proximity to the new housing and with very limited road access, has been 'reserved' for future railway use on the north-eastern edge of the development. 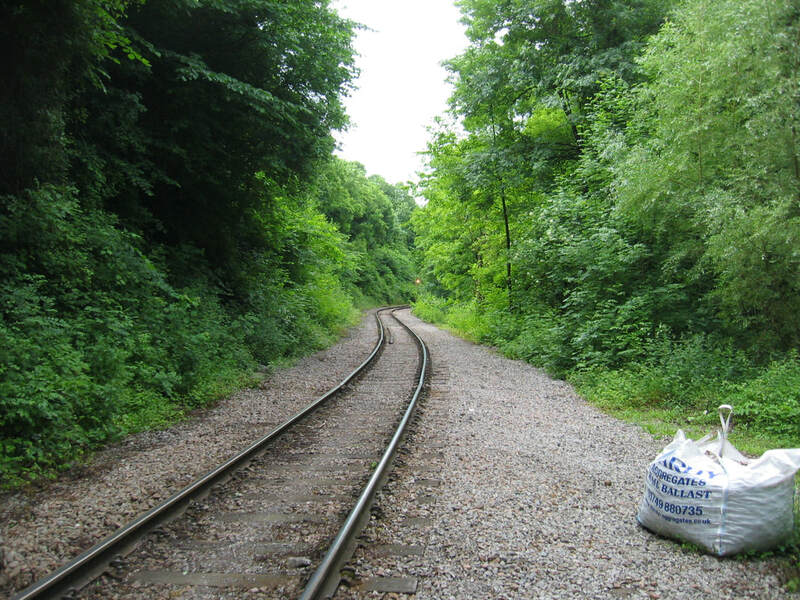 The line itself has not been used for almost 30 years and much track is now missing, especially at the Great Elm end of the line. 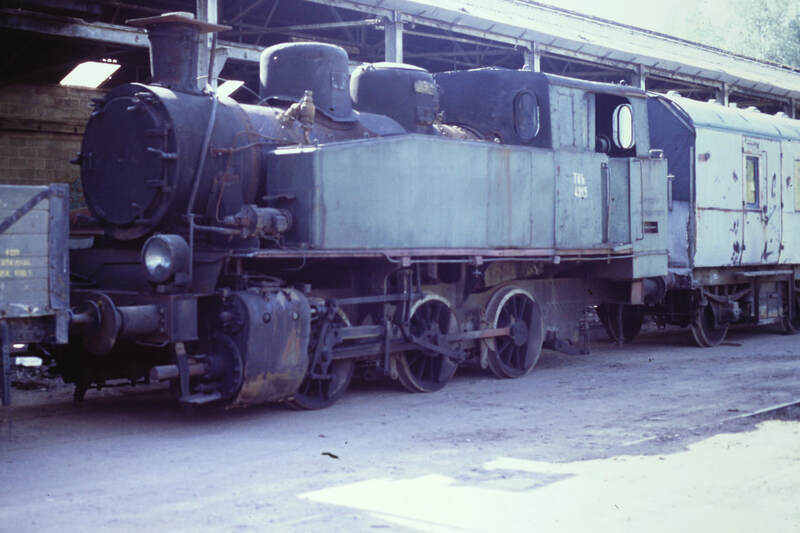 All the remaining track will need to be replaced as it is in such poor condition. 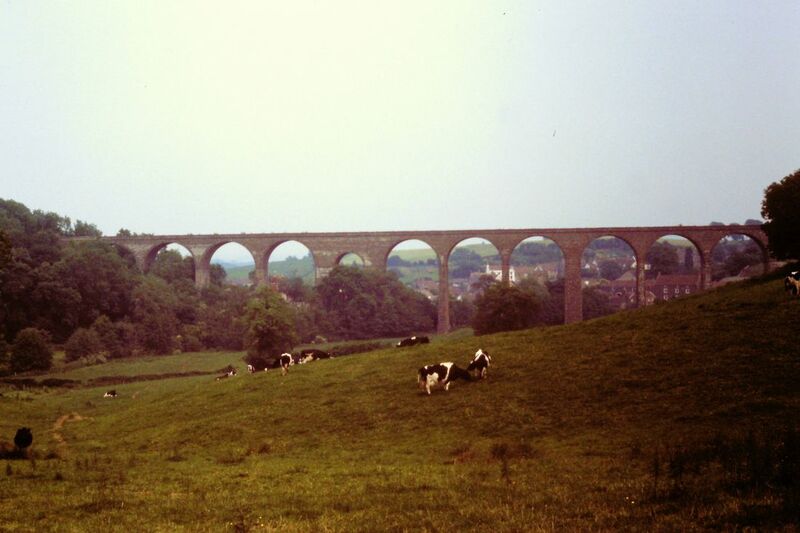 Three landslips have occurred on the route since abandonment by British Rail in 1988 and substantial work will be needed to enable trains to run over them again. 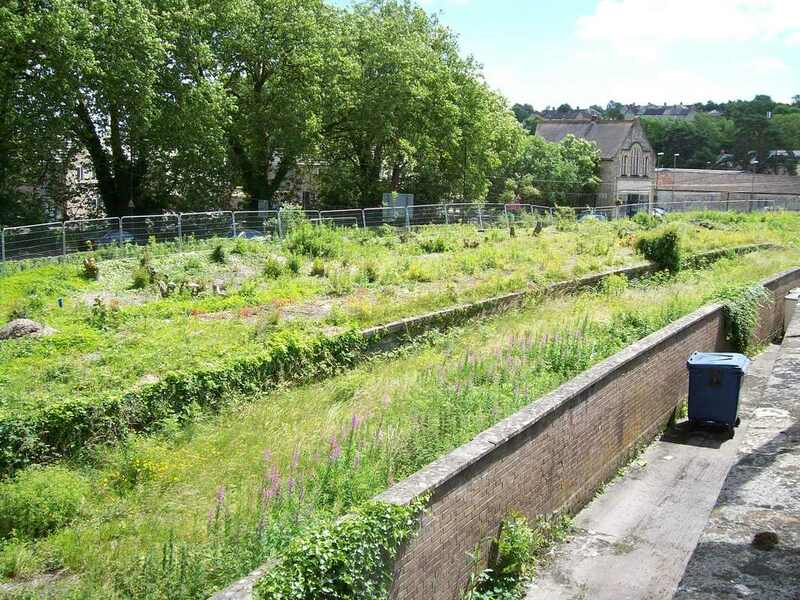 Between Radstock and Mells Road the steeply graded, wooded section runs through a deep cutting that has just about been returned to nature with flora and fauna well established. 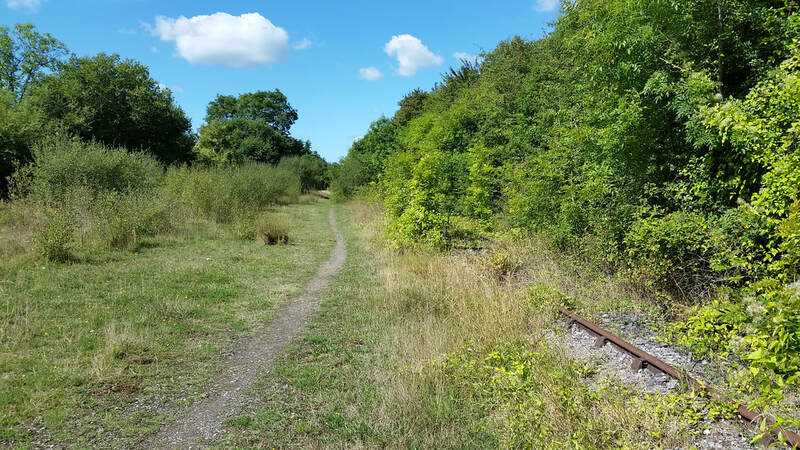 There is no signalling along the 5 mile route and at Hapsford Junction where the Whatley Quarry branch diverges from the abandoned branch all points have been disconnected and partially recovered,along with the track towards Buckland Bridge, the first public access point. 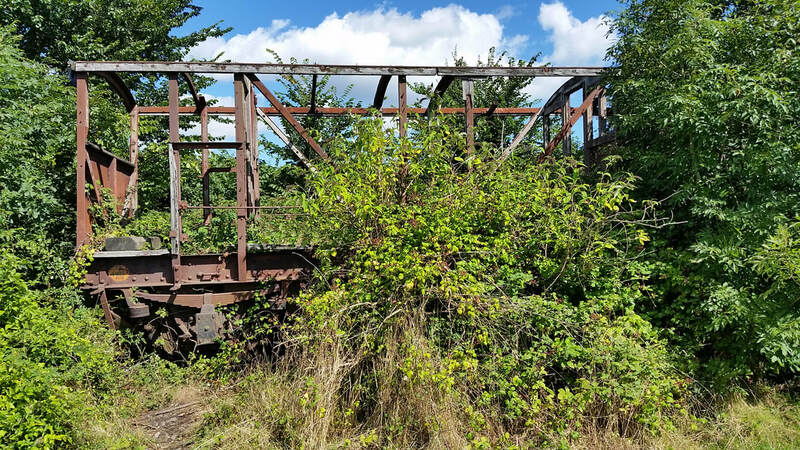 Nature has well and truly taken hold of the entire route and, frankly, although noises have been made over many years about re-opening this line, very little evidence exists that this will ever happen. There would appear to be a small group of people who genuinely have the wish and belief that it can, but, having walked the route last year and enjoyed the peace and astonishing variety of plant and wildlife species that have now colonised the route, I personally believe that it should be left as it is. Far better for efforts to be concentrated into taking the East Somerset Railway into Shepton Mallet or extending the S&D Midsomer Norton line down into Radstock. 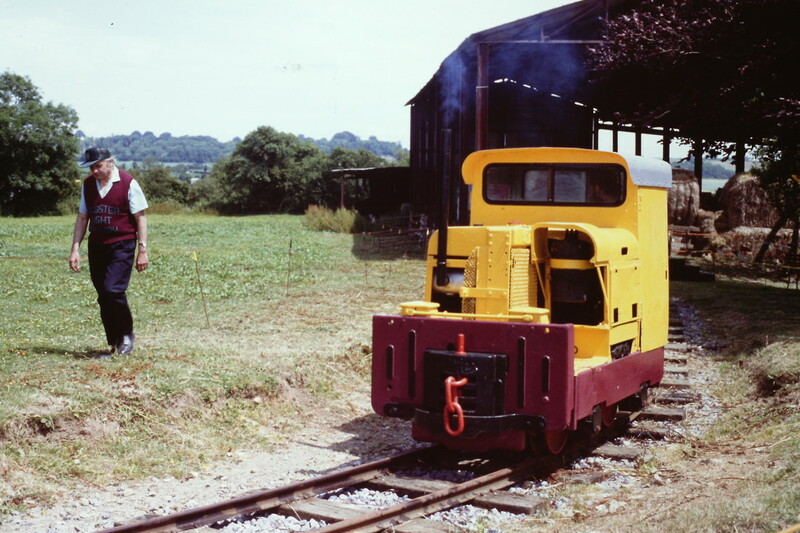 Try the group's website: Home - Heritage railway between Radstock and Frome - North Somerset Railway Company Ltd to see what they have to offer. The info does not appear to have been updated for some time now..
MELLS ROAD OS 25 inch Scotland, 1892-1949 England and Wales, 1841-1952 'Reproduced with the permission of the National Library of Scotland. Mells Road station at upper centre the main branch line to Frome to the right and to Radstock to the left. 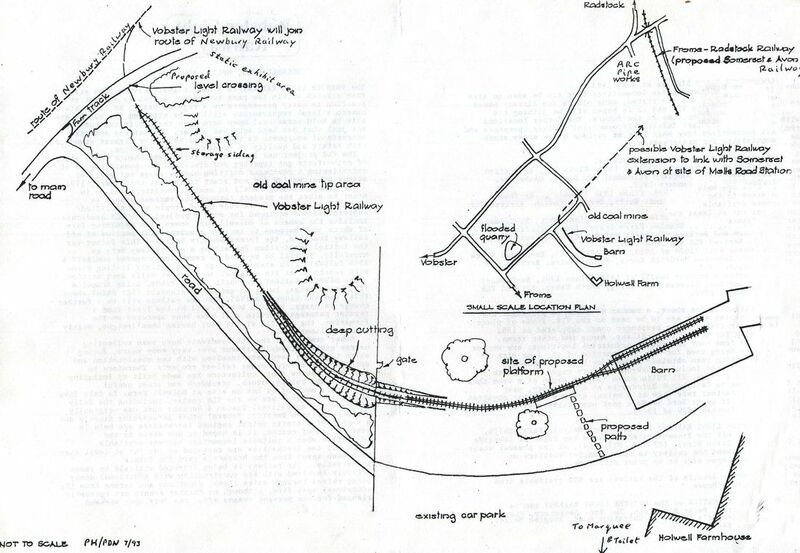 The line heading south is the Vobster Branch - this continued on the map below on the right hand side. 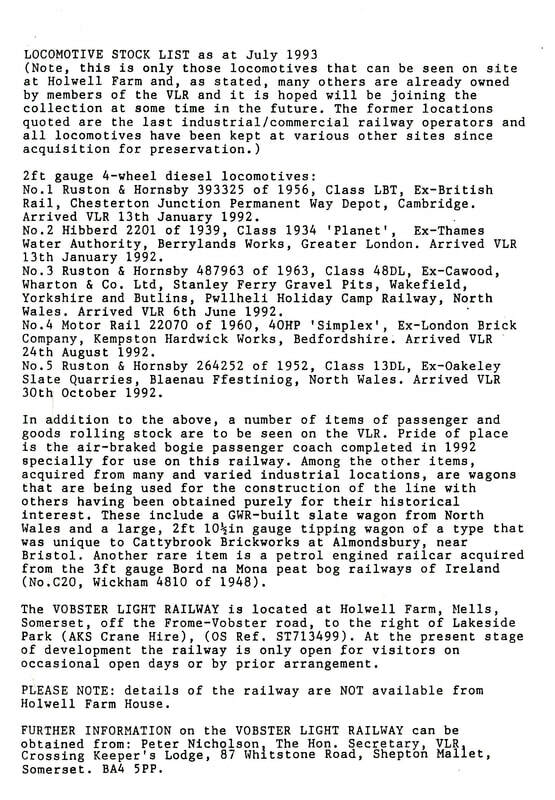 Some additional information kindly supplied by John Thorn with reference to the map above. 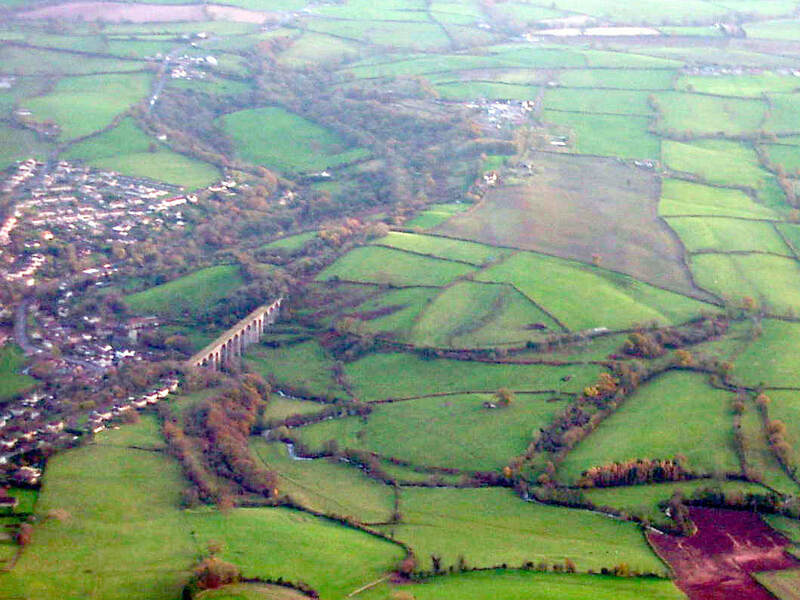 The track winding around the Vobster branch is the route of the Dorset and Somerset Canal. This was actually a canal branch to connect the coal fields at Nettlebridge with the main canal at Frome. 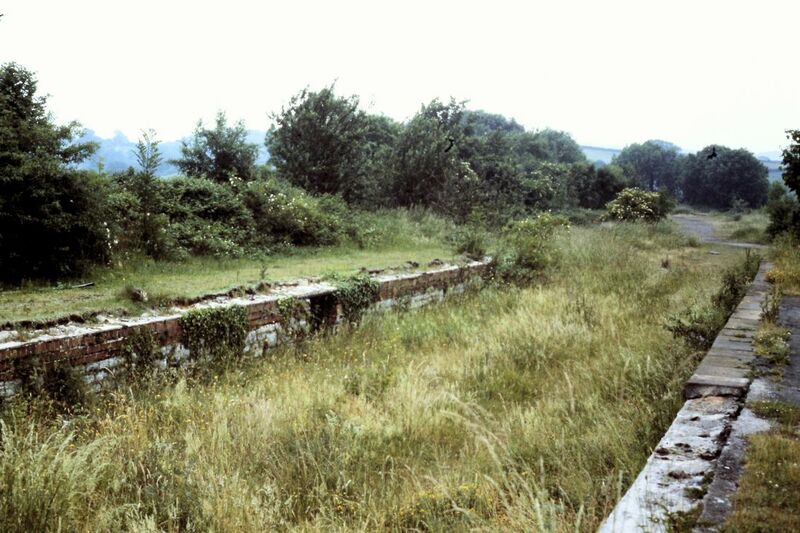 Never completed, there are some remains including an aqueduct in Coleford. 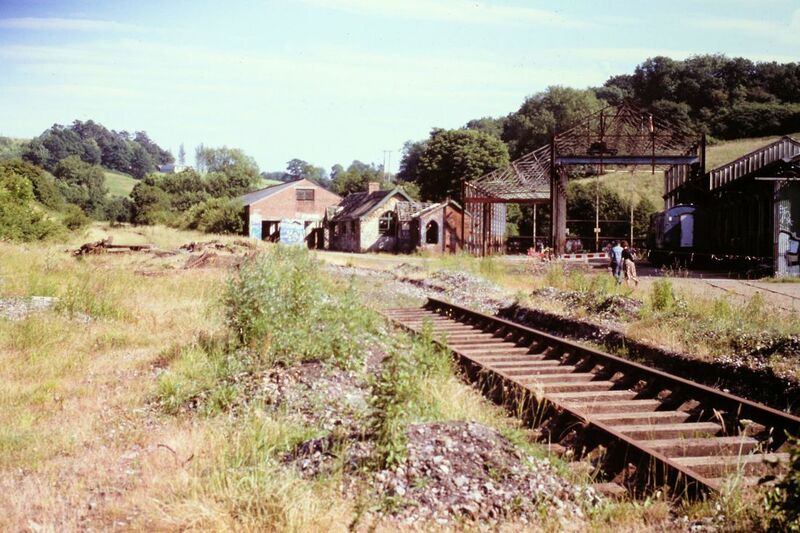 On Barrow Hill between Mells Road and Frome experimental 'Balance docks' were built as an alternative to locks. John Thorn Many thanks indeed John. VOBSTER BRANCH from the OS 25 inch Scotland, 1892-1949 England and Wales, 1841-1952 'Reproduced with the permission of the National Library of Scotland. 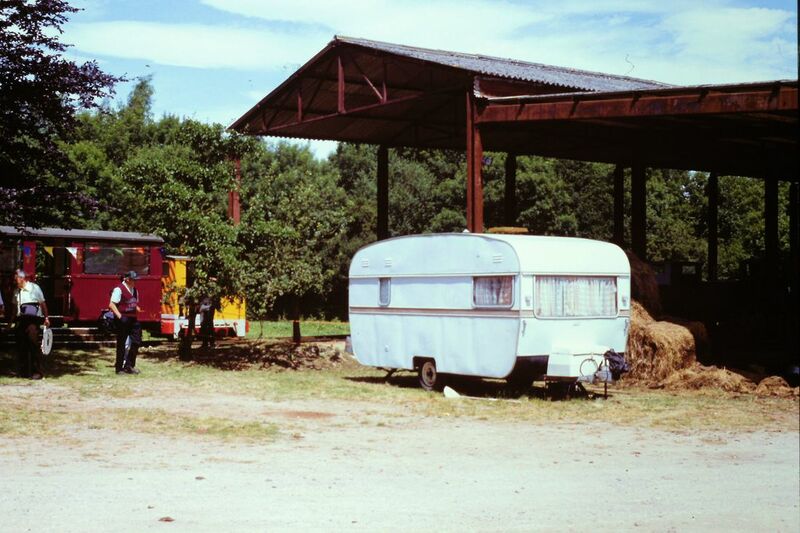 This branch served in addition to Vobster Quarry, the Newbury and Mackintosh Colliery's. 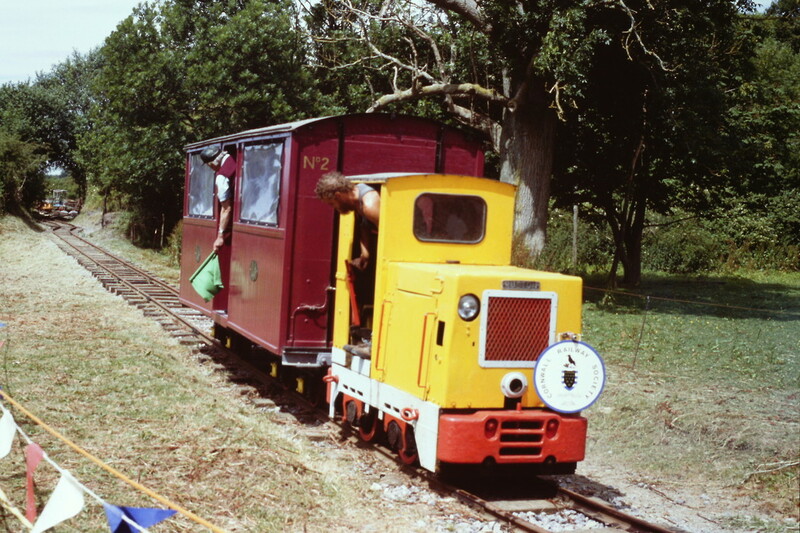 See further note on the Vobster Light Railway at the end of this selection of pictures. 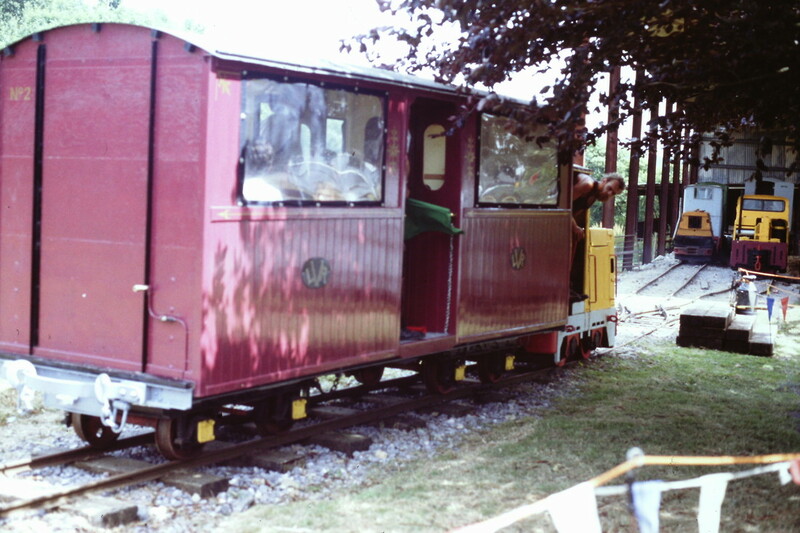 See further note on the Vobster Light Railway at the end of this selection of pictures. Writhlington Complex at Kilmersdon Copyright Martin Scane..N.B. 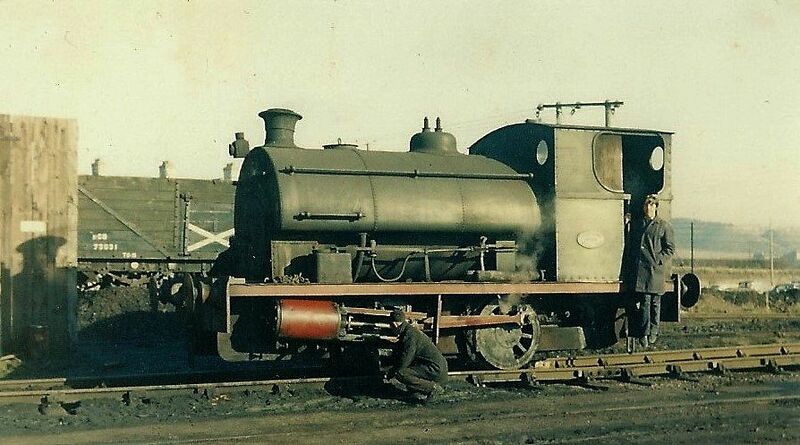 This is a young Martin Scane proudly standing on the footplate. 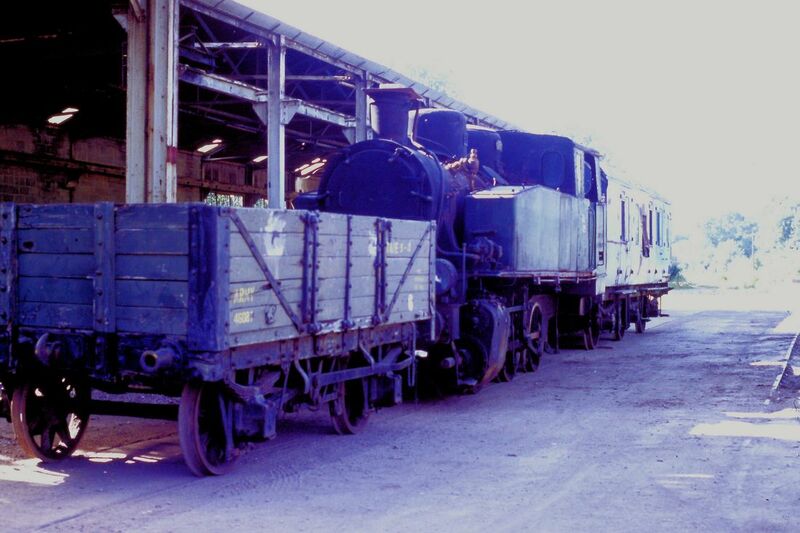 A rare photograph of a train at the then end of the Frome - Radstock branch at the Wagon Works. many thanks to John Cornelius for this picture - his copyright. 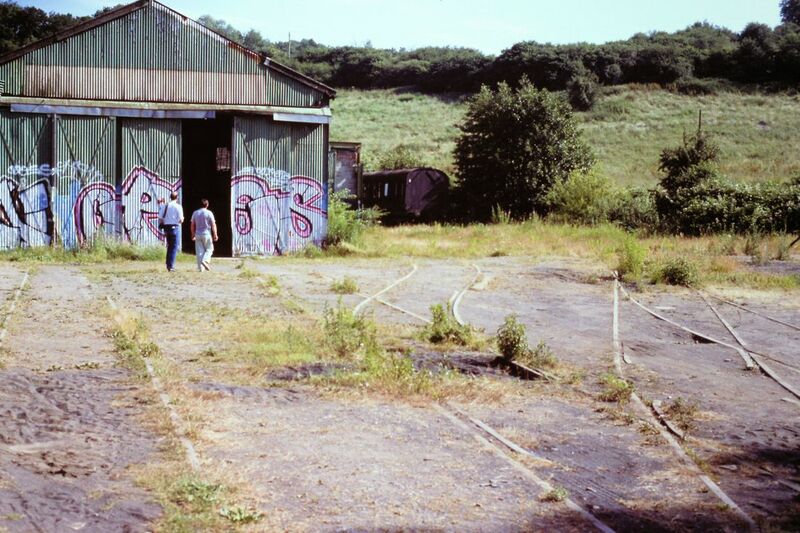 The Cornwall Railway Society on a minibus tour paid an official visit to the Wagon Works area at Radstock. Some of the pictures appear below. 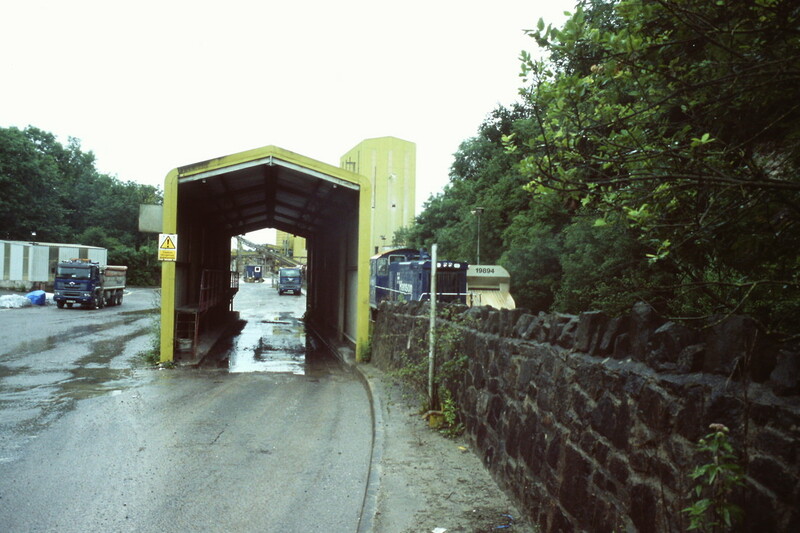 Looking back towards xxxxxc works. Room is being left for a cycleway, not a railway. Copyright Colin Burges. Farrington Gurney History. The station opened on 11th July 1927 by the Great Western Railway. Situated north of Paulton Halt and south of Hallatrow station. 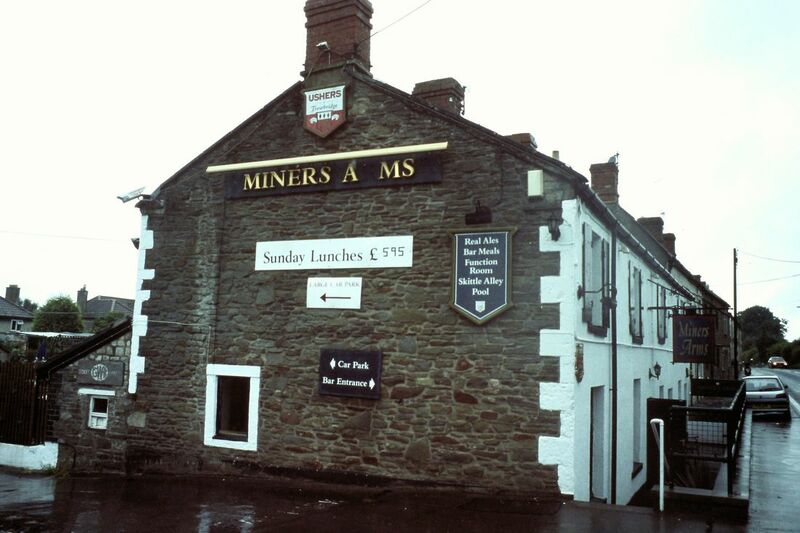 Passengers had to buy their tickets from a tiny office behind the Miner's Arms pub. 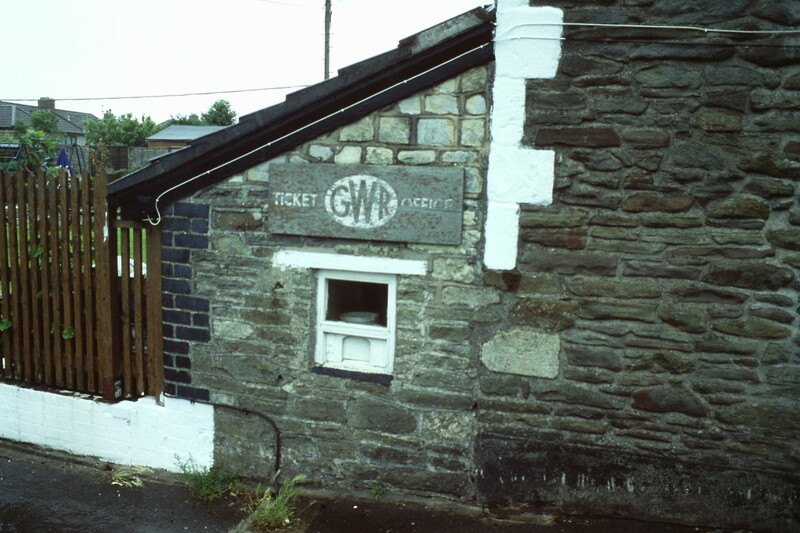 The station which was situated at the location where the road heading east out of the village passed under the railway. 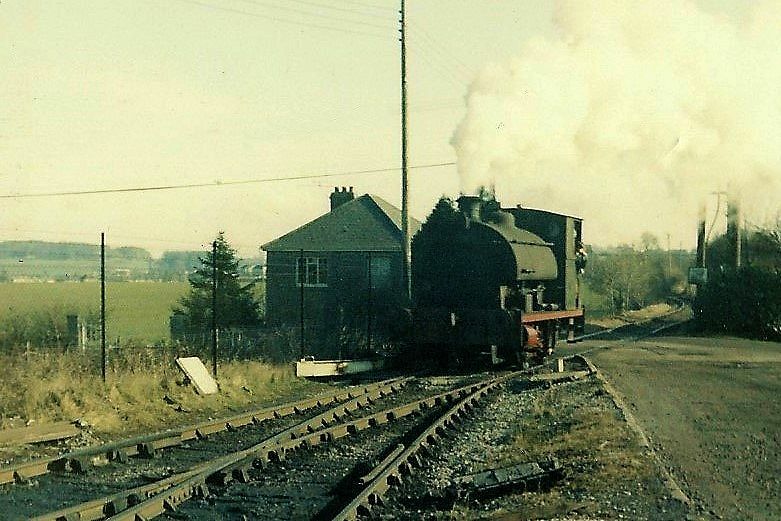 The station was closed to both passengers and goods traffic on 2nd November 1959. HALLATROW & CAMERTON BRANCH OS 25 inch Scotland, 1892-1949 England and Wales, 1841-1952 'Reproduced with the permission of the National Library of Scotland. 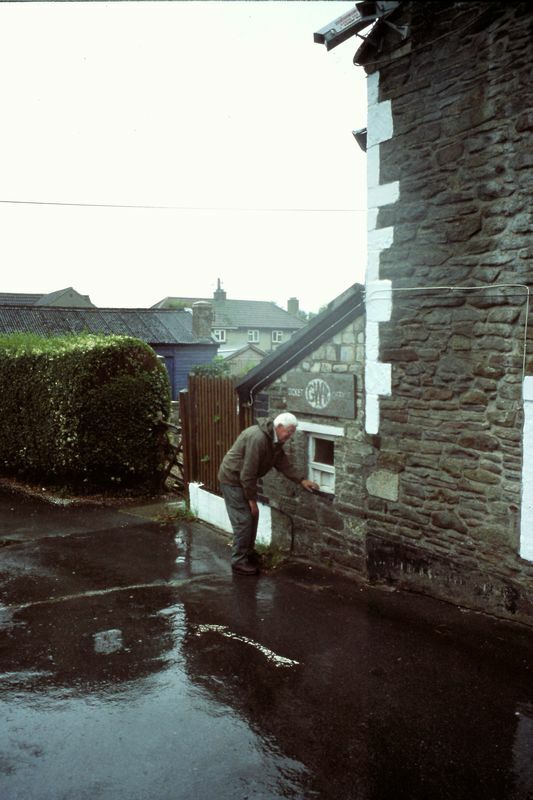 Note:- On the map above its will noted that the Camerton branch opened in 1873 is shown extending only to the right hand edge of the map - this was the situation in 1892 Opened in 1873, it joined with an existing branch from Frome to Radstock, and was later worked with it as a single entity. 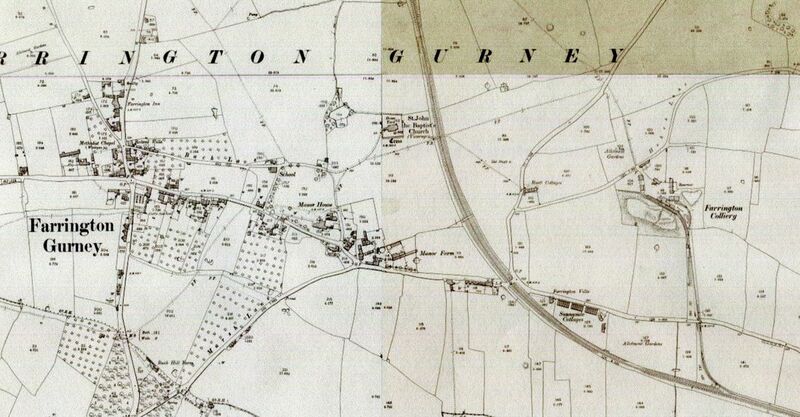 In 1882 the Camerton Branch was opened by the GWR to serve collieries at Camerton; it was later extended to Limpley Stoke, on the Bath to Trowbridge line. 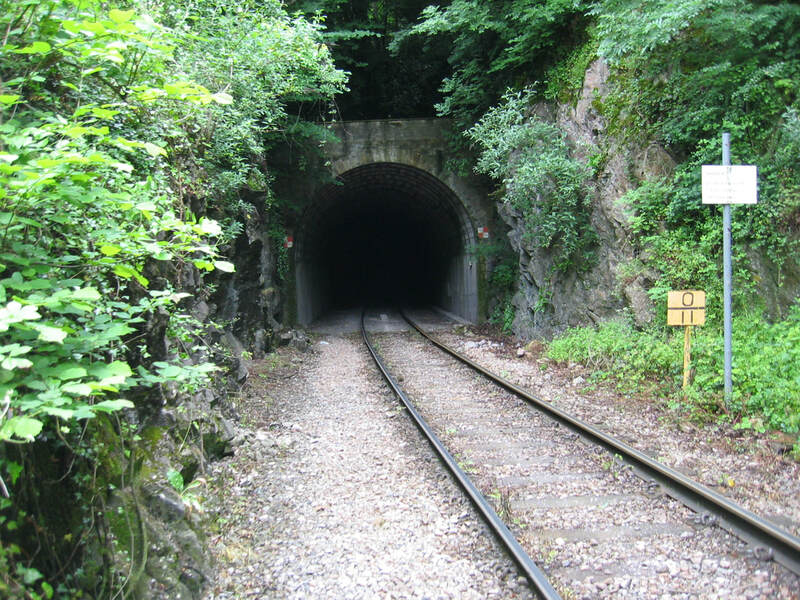 It closed to passenger traffic in 1925. 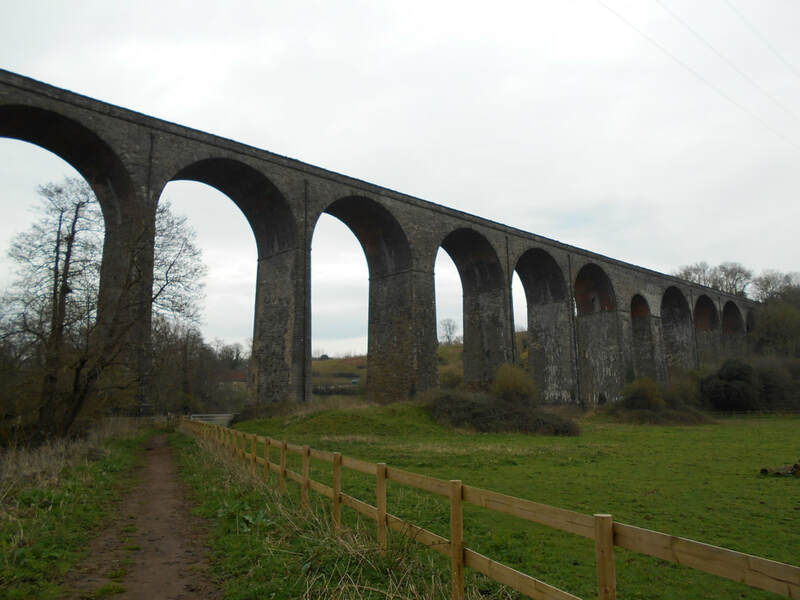 The Grade 2 listed 16 arch Pensford Viaduct was built in 1874 to carry Bristol and North Somerset Railway. it is 995' long and 95' high. 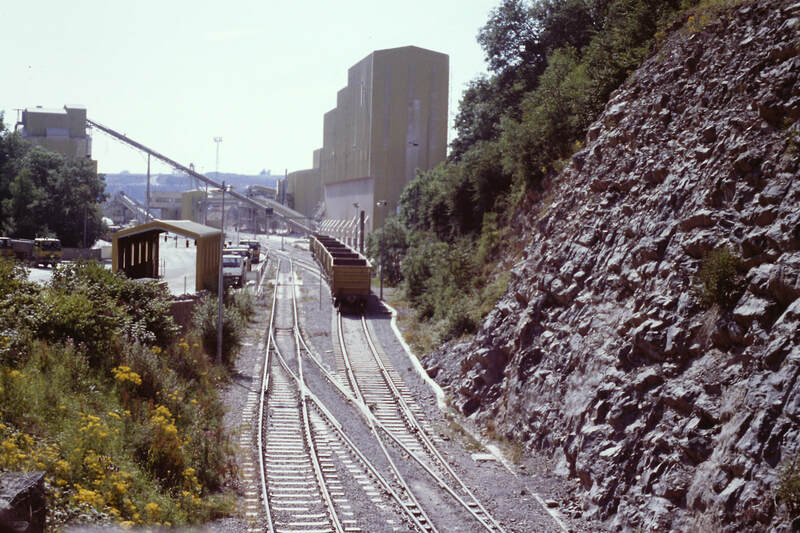 The line it carried closed in 1968. PENSFORD OS 25 inch Scotland, 1892-1949 England and Wales, 1841-1952 'Reproduced with the permission of the National Library of Scotland. The station is in the centre of this map with the viaduct to the south. BRISLINGTON OS 25 inch Scotland, 1892-1949 England and Wales, 1841-1952 'Reproduced with the permission of the National Library of Scotland. Brislington station is located at the centre of this map, the line continues towards Bristol at the top. 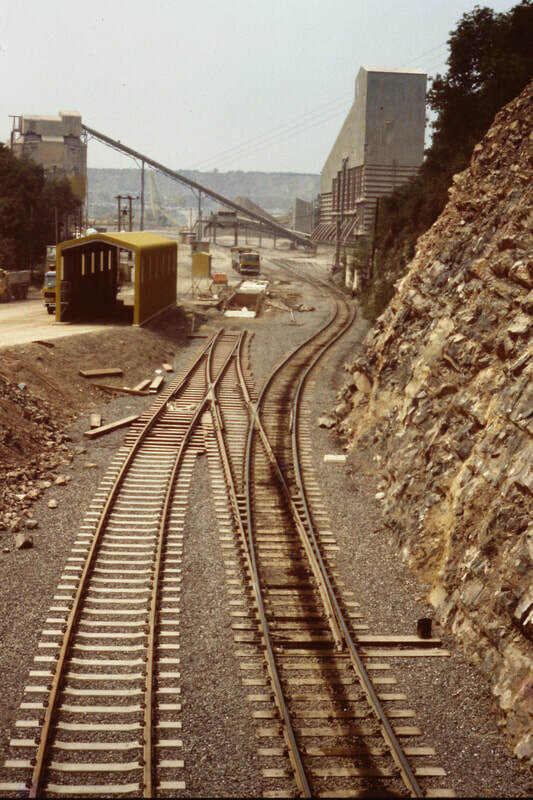 Of additional interest are the two competing tramway routes. 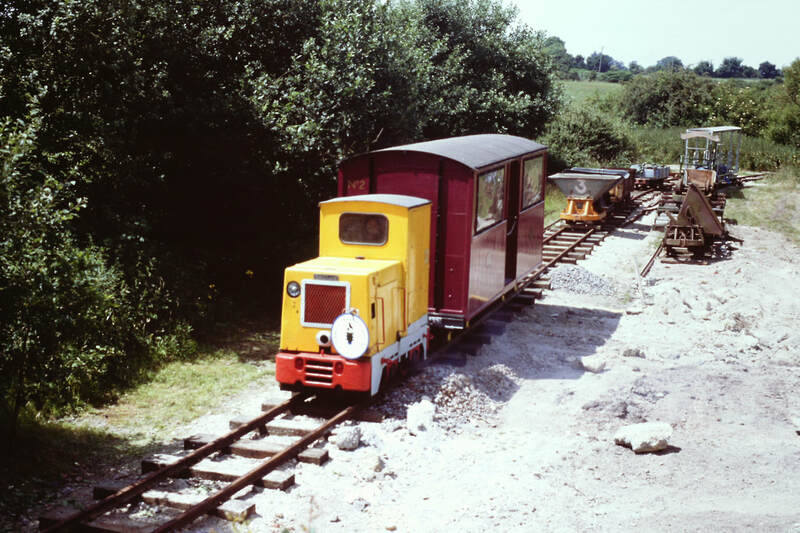 In this it mentions a short 2' gauge railway which only lasted from 1992 to 1994 after which the equipment was moved to Radstock. Quite what has happened since the we'd like to know? 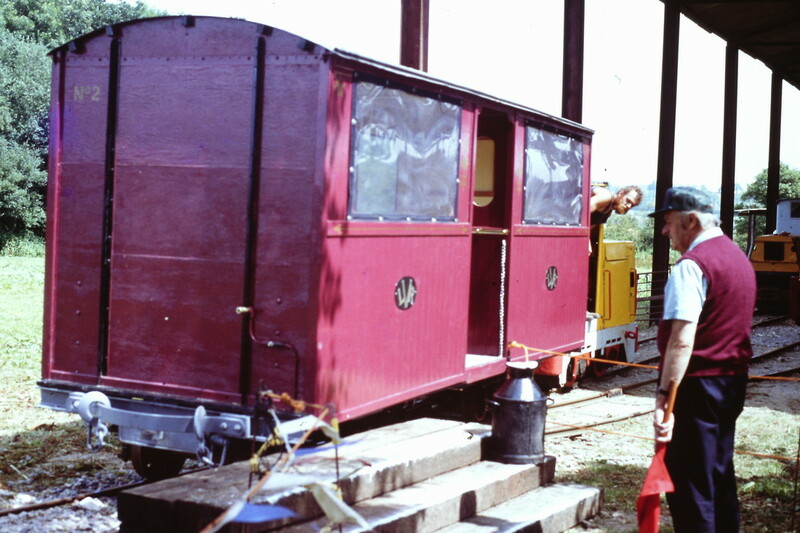 This picture is history indeed as our late Chairman Walter Julian videos a departure using his rather large camera. In the background the proceedings are observed by the late Peter Moore who passed away in September 2017. Copyright Roger Winnen.